Greentown, Illinois, and the summer of 1928 is about to begin. Douglas Spalding is twelve years old, a good age, and summer is a magic time when he can sleep in the high cupola above his grandfather's house and watch the town go to sleep and wake up. There's a pair of shoes in a shop window, which Douglas knows will allow him to run fast as a deer. There is Mr Jonas, the junkman, who saves lives and redistributes those things that some folk don't want to others who do. Leo Auffmann the jeweler is intent upon building a happiness machine. In the great house lives Colonel Freeleigh, the human time machine who remembers the great herds of bison. And dividing the town is the ravine, a dark green place, primeval and frightening, the sort of place that might be haunted by the Lonely One. The story of Lavinia Nebbs and the Lonely One, is the strongest section of the book. This is where the book tips from its golden vision of childhood into fear and horror. And all summer long, Douglas, his younger brother Tom, and the other neighbourhood kids collect dandelions to bring to Grandfather's place, where they are taken to the cellar and pressed to make golden bottles of dandelion wine. 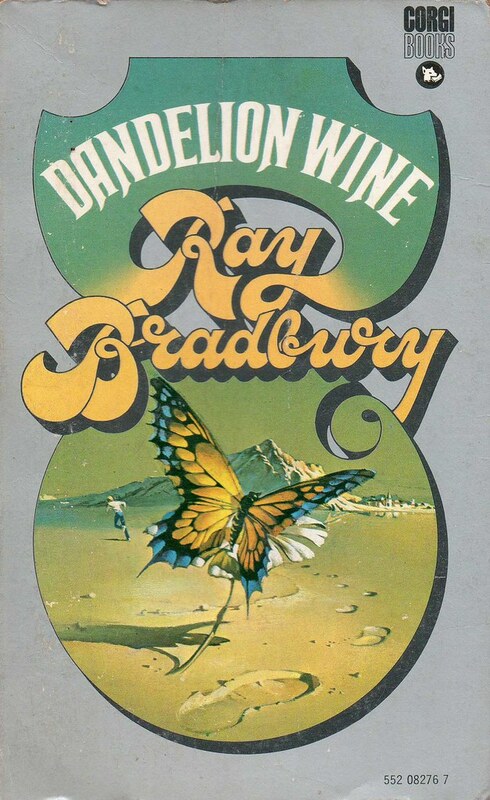 There was a time when I felt I had to make apologies for liking Bradbury, for his occasional sentimentality. But taken overall, very few have matched his seemingly effortless portraits of middle America with its time-locked small towns, or his brilliant Martian landscapes. In recent years, his writing became more powerful than ever before; and his influence can be seen in writings as diverse as those by Leigh Brackett and Poppy Z Brite. Small portions of the book were previously published as follows: Season of Sitting in Charm (1951); A Story About Love in McCall's Magazine; The Swan in Cosmopolitan; The Magical Kitchen in Everywoman's Family Circle. This cover from a uniform edition issued by Corgi in 1969 isn't credited.